The increased use of voice-activated technology has led the general public and some legal professionals to believe that court reporters are on the verge of extinction. But savvy judges and litigators know that no machine, device, or app can replace the highly skilled live court reporter. There are myriad reasons why certified shorthand reporters are needed. At a minimum, as guardians of the record, they ensure (1) Accuracy, (2) Confidentiality, and (3) Impartiality. In 2008, I discovered that law firms and other organizations offer mock depositions to train their attorneys in the art of taking and defending a deposition. Since then, in collaboration with law professors, law firm administrators and litigators, I have provided advanced court reporting students and newly licensed court reporters at mock depositions and mock trials throughout the greater San Francisco Bay Area. (1) Interrupting as needed to ensure the integrity of the record. This provides a “reality check” to participants to be more mindful that every word is being transcribed into a permanent record and to avoid speaking too fast, talking over one another or mumbling. (2) Producing a rough draft or final transcript. This useful tool helps participants learn how to improve their performance when presenting their case, questioning and defending witnesses, or testifying as expert witnesses. In real life, some litigators and judges do not like to be interrupted and may question a court reporter’s competence. Yet it is a court reporter’s legal and ethical duty to provide a verbatim record of the proceedings. If a reporter is unable to hear or understand what participants are saying — i.e., when they speak over one another, incoherently, or too fast — it is his/her duty to interrupt. Most importantly, if a professional who has spent thousands of hours perfecting his/her craft and developing deep listening skills cannot hear what is said, neither will a judge or jury. 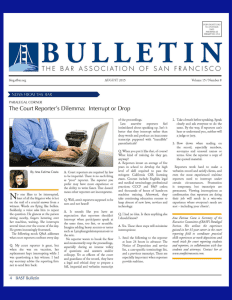 As a result of the above, I wrote the article, The Court Reporter’s Dilemma: Interrupt or Drop. * (More articles on my Career page). 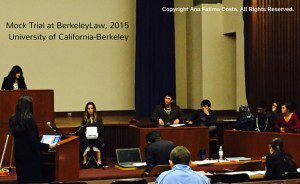 The above featured photo was taken at a mock trial at BerkeleyLaw on November 2015, in collaboration with Adjunct Professor and Alameda County Assistant Public Defender Charles Mandeville Denton, III (wearing the light blue jacket). The court reporting student is California CSR candidate Shana Ray, who has been legally blind since birth. Learn more about Shana and this event here.